Club Penguin Cheats by Mimo777 Club Penguin Cheats by Mimo777: Club Penguin October Sneak Peek! Im looking forward to the dark maze the most!!! Im looking forward to mostly well... everything! I can tell October will be a sweet month. Me too!! It does sound scary! October is my favorate month in Club Penguin! I'm looking forward to the Anniversary Party, absolutely! Can't wait to see this year's colors! ya ut might be cool even they might have glowing hats! October is the best month ever! Halloween party, Dark Chamber, CP aniversary, more stamps, AND MY BIRTHDAY! notice the anniversery picture. notice the color of the brush. notice the color of the hat. new hat possibly silver, bronze, or gold? Yeah! especialy since halloween is almost here! me too. It's probably for members though. It sure will be. Even better with halloween right around the corner. wow! that must be exciting. I well. i dont know. I do know october will be fun but the Christmas party or cps "holidays party" is never as fun as it was. Im against the holidays party change. I loved christmas. If your going to take away christmas just take away all holidays! I think we should make a strike! (Even though its months away we could change it in time if we got enough). You mean the Dark Chamber? yayyy! halloween is my favorite holiday in and out of clubpenguin (out of clubpenguin mainly becuase its also my birthday..... so basically everyone gives me candy for my birthday.... even people i don't know! :p) anyways, i REALLY want to win the igloo contest this year! it going to be really awsome if i do! im also looking for new halloween costumes, i have ALL he old ones, although some of them arn't actually halloween costumes but are from plays or partys. my faveorite is dressing like a skelaten or ghost or frankenstine and my orange and green scarf and halloween trick-or-treat bucket or bag thing. (like the penguins in the tresure book exept i got it from clubpenguin a long time ago) but they didnt mension a candy hunt.... i hope they still have one! if they don't that will be kind of a bumer! i've been talking (actually typing) for long enough waddle on! Mine too! it's the best month eva! Me too! I love the anniversary parties! So excited! I love catalogs, parties, and igloo competetions! 1. I just like new clothing for my penguin and some new furniture for my igloo! 3. There hasn't been an igloo competetion since LAST Halloween! This October is gonna be SWEET! I cant wait for the Halloween Party. My brother wont stop talking about it. The Dark Maze sounds awesome and the anniversary party looks cool. And be on the look out for my igloo call The Woods Of DOOM!! It going to be fun. yeah,it doesn't look like a penguin,mabey herbet? Yeah! That would be really cool! I hope they dont make everything for members though! i am mostly lookin foward for the halloween party the most and the anniversary party! waddle on! Hmmm. sounds ok but I quit my membership (maybe for good). Club Penguin is ok but I feel like it wasn't like it ever used to be. No one talks at partys, everyone is random and its all about IGLOO'S! Anyone feel what I feel about CP? Maybe you could buy another one? Yeah, but i have been for CP for like 1 year in non-member but maybe you can buy another one? cant wait!this is going to rock! 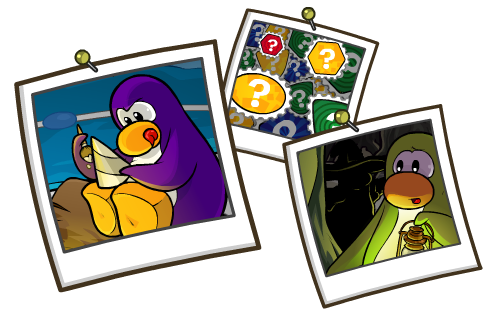 I dont know how i know this but in the stamp picture, the penguin looks like they are sitting on a rock at the cove! cool right. This Years party is gonna be wicked! Mimo i think I know what their ging to do.They are problably going to let us paint our own party hat.